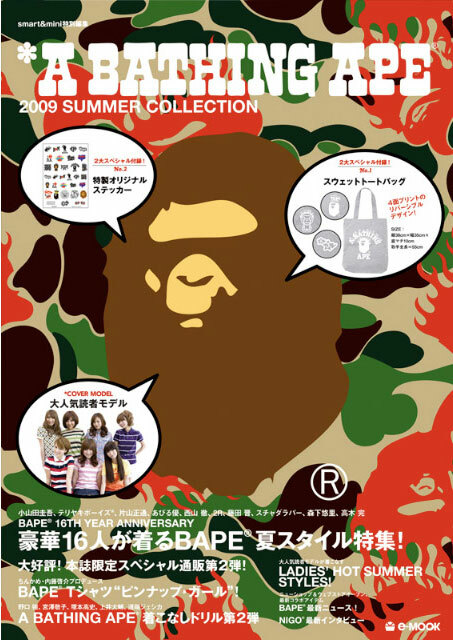 Out soon (April 20th) is BAPE's new summer 2009 catalog. I call Nigo the streetwear's Puffy because he is just plain smart about his merchandise (Doesn't mean it's all great, like Puff). At first I was fasinated with the way he works his stuff to be limited and still have the same things over and over ($$$) just in a slight different pattern or color. People eat it up! Why? Not fully sure yet, but It just goes back to limited, I have what you don't, exclusive. I am not saying the designs he puts out are garbage (only some, hehe), but I think it gets more attention because of his marketing skills. More power to ya Nigo! The cool thing about these 15-20 dollar (Don't remember exact amount) catalogs, is that they always come with some cool mini toy/accesory/bag. Sure does sucker me into buying em once in a while. Check the top right to see what bag this one comes with.